The rapid development of technology has touched all spheres of human activity. Architecture is no exception. 3D technologies were introduced, greatly simplifying not only the interaction of customer and service provider, but also the work of architects and designers. 3D visualization of Private Residence is a great opportunity to look at the future home with own eyes. Thanks to 3D visualization technology, you can enjoy your dwelling looking at the computer’s screen, adjusting the exterior and interior, choosing finishing materials or changing the plan of the premises. All these will allow to create your dream house most accurately, in which it will be comfortable and cozy. • Accurately simulated object in 3D. • The maximal realism of the texture, thanks to which it is possible to evaluate not only the house itself but also its environment. You can see how attractively decoration will look like at home and even more. You receive the unique opportunities, of which you have never dreamed before! • 3D visualization allows to reveal the environment, how it will look like in different conditions of terrain. In addition, you will be able to select harmonious landscape for your house. • Save time, money, efforts and nerves. • Make adjustments quickly, based on the comments. • Visually assess all the advantages and disadvantages of the future house. Seeing the three-dimensional image of the future house, which can be viewed from different angles and different lighting can be the only right choice to estimate the entire picture. So it is not surprising that the 3D Rendering of the Private Residence and 3D visualization of exteriors became extremely popular. Development of 3D technology allowed to receive the best possible photo-realistic image. This effect and the results will not be received from any drawing of even the picture of best quality. That is why many private architects and studios work exclusively with 3D visualization of projects. 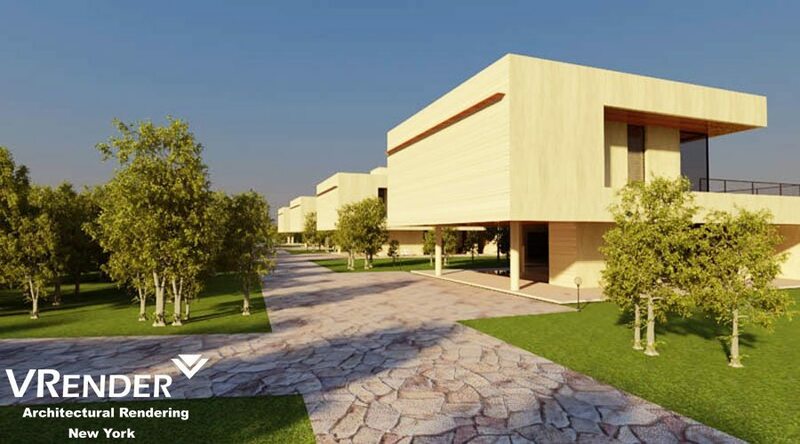 Now, the investor or owner can look not just at the dry calculations and drawings, but also at a bright, rich, and the most realistic vision of the future building or a Private Residence. Three-dimensional graphics and 3D modeling are the computer graphics, combining the techniques and the tools required to create dimensional objects in the 3-D space. “Techniques” are the formation of three-dimensional graphic object – the calculation of its parameters, drawing of the “skeleton” or not detailed voluminous form; extrusion and cutting parts and so on. “The tool” is the professional program for 3D modeling. First of all they are 3DS MAX, SolidWork, ProEngineering, as well as some other programs for volume rendering of objects and space. Voluminous rendering is creation of a two-dimensional raster image based on the constructed 3D model. Basically, it is the most realistic 2D portrayal of the volume graphic.